Couchers de soleil du golfe du Mexique! Réservez vos dates d'été tôt! Ce point de vue chalet Golfe se trouve à quelques pas des plages de sable blanc de sucre et les eaux cristallines du golfe du Mexique, où vous pouvez regarder les dauphins jouer que vous prenez votre promenade matinale sur la plage ou de regarder les plus beaux couchers de soleil de votre vie. Le golfe est directement en face de la rue avec une vue complète de la propriété et accès à la plage 1/2 pâté de maisons. Vous serez dans des blocs de plusieurs bons restaurants, des boutiques de crème glacée pittoresques, historique, rue Bridge, avec des commerces et un golf miniature. Le célèbre Anna Maria Island arrêt de tram est à deux rues de distance qui vous donne un accès complet à l'île et le bus local ramasse ici et vous donnant accès à l'ensemble de la région. Ce chalet a été récemment rénové avec tous les nouveaux appareils et est entièrement meublée avec tout ce dont vous pourriez avoir besoin pour vos vacances de rêve, tout ce que vous devez apporter votre vêtements et effets personnels. Vous aurez des serviettes de plage, chaises de plage et parasol, barbecue, terrasse, tout ce que vous avez besoin pour rendre vos vacances un dont vous vous souviendrez. Si vous avez besoin d'un service de navette aéroport, je peux vous fournir les coordonnées d'un chauffeur local, moins chères que les autres options. Si cette propriété est réservée, veuillez consulter l'unité B VRBO 653760 car il s'agit d'un duplex dont les deux unités sont identiques. Si vous avez besoin d'un service de navette aéroport, je peux vous fournir les coordonnées d'un chauffeur local, moins chères que les autres options. ...though we did make it to the beach for those great sunsets sometimes! Including, dinner at The Beach House, right across the street. 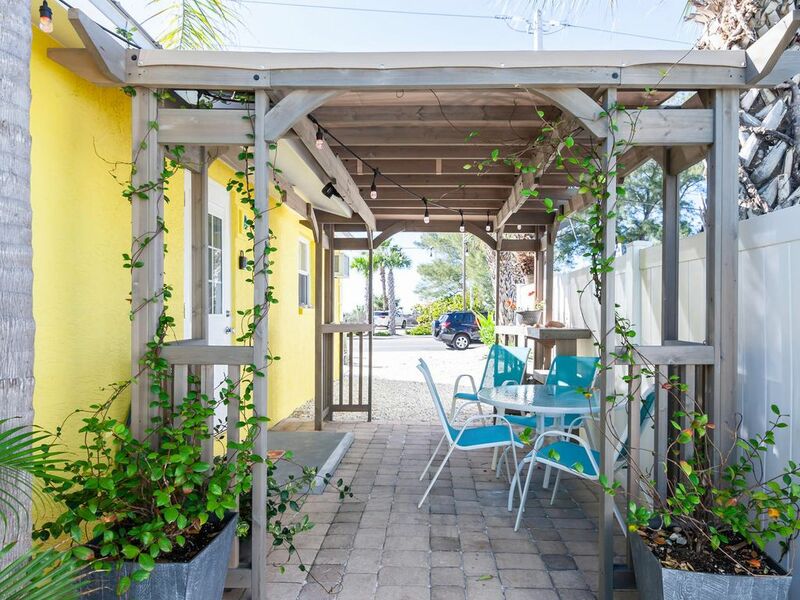 We thoroughly enjoyed exploring all of Anna Maria Island and ate twice on the beach at the Anna Maria Beach cafe. Holmes Beach offered a charming little place called "Eat Here", which turned out to be very proper and much more gourmet than the name would suggest. All in all, the property itself was exactly what we needed after a very difficult Summer with hospitalizations and such. Just the right size for the two of us and furnished with everything you could need and then some. And don't forget the darling little pergola and vine covered patio just next to the beach access, complete with gas grill. Randy stopped in to make sure all was in good order and even exchanged a conventional coffee maker with a Keurig for us, because it happened that all we had brought was pods (though there was a large can of Folger's available!) Just spoiled, I guess. I would highly recommend this cottage, so convenient to the beach, restaurants, shopping, Cortez fishing village,etc.. We even went to Longboat Key and had lunch at the famous St. Armand's Circle...though if we had bothered to shop and cook, we would never have had to leave this sweet little cottage! It was so nice to meet you guys and I so very much appreciate your business. We look forward to having you back anytime you would like to visit. Perfect little bungalow across the street from the beach. We spent three days here with our daughter and her husband for Mother’s Day. It’s a great location for walking to most everything. Very well stocked with everything you need, and I mean everything, there was even a small bottle of nail polish remover. Loved the white noise machine in the bedroom for sleeping as you are on a very busy road, although inside you didn’t hear any road noise. Decorated very beachy. The owner and caretakers were always close by for any problems, which we had none. We parked two cars without a problem although the cars do block your view while sitting under the pergola. Just a couple of very tiny suggestions ; it would be nice to have another skillet in the kitchen, one isn’t enough when cooking breakfast, a square stove top griddle would be a big plus. According to our daughter the sofa bed wasn’t great, as with most pull out beds, so maybe a foam topper might be nice. Another suggestion to Randy is he should put a name on his property so when people ask where we were staying we wouldn’t have to say “ that little yellow place by the bridge”, I love seeing the names people come up with for their vacation homes, like naming a boat. We had a great time on this island, lots of different types of restaurants, all the wait staff were very nice and friendly we will be back. Thanks Randy, Brenda and Mike we enjoyed your piece of paradise! Thanks guys for your stay and also your feedback, we appreciate it very much. Consider the recommendations done! We do have a name of the property, it is Bradenton Beach Sunsets and is on our VRBO listing, but guess we need to put a sign up. Thanks again and we look forward to having you back! This was our first time using VRBO and it was a good first impression. The unit we rented was very well taken care of thanks to Brenda. We had everything we needed for our 10 day stay..... including beach chairs and towels. Brenda was a phone call away to answer any questions we had or if there was a problem. The owner, Randy Allen, stopped by to meet us and to make sure everything was to our satisfaction. We would definitely rent from Randy again and highly recommended VRBO and this property. We absolutely loved this place! We'll definitely be staying here again! The stay was better than I ever expected it. Everyone was so helpful, you don't need to worry about a thing. beach Umbrellas, chairs, towels, laundry/dryer machine are all provided. Besides, being across the street from the beach, the quick access to the free trolley, and plenty of places to eat allow for a great vacation. But what I think really made it worry-free was the team of this location. I brought my lady here for her birthday getaway and she said it could not have been any better. She loved everything about how everyone was so friendly and how well we were taken care of. If you are looking for an intimate relaxing getaway with minimal worries, please look no further than this location. Thanks Kevin, it was nice to meet you guys and we are thankful for your stay with us. Look forward to having you guys back down again. Absolutely great except for parking. Great. We were there for my mother-in-laws 100 birthday and the place served our purpose. Thanks so much for your stay. I am sorry I missed you guys when I was out, I might been about to help with any parking questions you had. I have some excess parking available had I known. Thanks again. Holiday weekend rates are subject to change.